I came across that enjoyable Chandler rant again while reading for this post. He's right, and I know of at least two prominent crime writers who have had similar complaints about editors and copy editors. But his complaint about proofreaders insensitive to their material no more applies to good, sensitive copy editing and proofreading than complaints about Dan Brown's prose style apply to Hammett or to Chandler himself. A good copy editor doesn't just know the rules, he or she knows when and how to apply them. I often think I must have been very wicked in a previous avatar to have deserved so many editors in this life. One of the best rants ever was by Henry James. I can't remember the details but the salient one referred to the way an editor, having been sent a story, delayed publishing and then needed thumbscrews applied before the work could be prised from his grasping fingers so that it could be offered elsewhere. Of course there are good editors. I have met many and without them I would not be living in a house, but in a tent under a windswept whin bush. What bothers me more than anything are the things that are allowed to slip into books that should not have required a copy editor in the first place. ("There" when "their" was called for. "Who's" instead of "whose." And so on.) This is more prevalent in self-pubbed Kindle stories, but I've seen random examples in "professionally" published book, too. There's no excuse--none--for the writer not to have caught mistakes like this, or he has no business writing in the first place. Peter, you know perfectly well that I speak my mind about the authors I've read. It's probably not a particularly good idea to do this, but it's usually frustration that urges me because I really wanted to like the book. Copy editors: Didn't know you were one. The only good one I've had was British. My guess is that I write British English, and Americans object. My experience with American copy editors is that they clearly try to prove to the publisher that they've earned their money. From my point of view, bleeding all over my ms. with silly stuff, unnecessary changes, and outright mistakes is not helpful, even if the person caught a couple of typos along the way. (We all make mistakes). Editors I mostly like. They are the folks that help you tighten the story and catch incongruities and contradictions. Those folks are no longer offered by all publishers. I've actually come to rely heavily on proof readers and have developed an admiration and respect I didn't necessarily always have. For the past three years I've been dealing with the loss of most of my sight, I can still see real close up, but it strains my eyes. So, I use a "screen reader" - text to speech, and they aren't reliable in catching, for instance there/their/they're where/wear, etc...and beyond that,'she' -for my go to proof reader/copy editor is a lady and not a native English speaker - catches some "odd" habbits of mine "I'd of" instead of "I'd have" being one. She's also very good at catching things I get to deep in to the story to catch, for instance when I'll change 'voice' in the middle of a paragraph, or needless repitition i.e. : "If you reread your writing you will find that a great many very repetitious statements can be identified by rereading and identifying them." as an example. And, even though her native tongue is Russian, she is pretty damn good at identifying "style" from mistakes. Peter, off topic, have you ever heard of H.H. Holmes? P à D, I can assure you that for every entertaining rant about editors from a Henry James or Raymond Chandler, hundreds of editors have far more gruesome and equally entertaining stories about copy submitted to them. Of course, there are good writers. The point to remember -- and I rarely, if ever, see this raised -- is that a good editor is a good writer. Dana, that sort of sloppiness bothers me, too. I've made mistakes, even of that kind, on this blog, and the "excuse" is simple: Only one set of eyes ever sees my posts before I put them up. I have to blame such mistakes in books on similar lack of scrutiny. I don't know if publishers shunt off proofreading and copy editing to B.A.s who couldn't find other jobs. But I have to suspect that they don't give such duties the respect they deserve. As I wrote in a previous comment, a good editor is, and must be, a good writer. Of course, Dana, the more complacent among us may call mistakes of that kind examples of our evolving language. I.J., I'm a copy editor for a newspaper. My role is a mix of what I think are those of proofreaders, line editors, and copy editors in book publishing. One fact of newspaper life, of course, is that deadlines often dictate that changes be made on the fly, without consultation with reporters in matter of style. It's hard for me to judge authors' complaints about editors without examples of those complaints. But an editor needs to be sensitive to what an author is trying to do. Repetition of a grammatical mistake or a quirk of speech may indicate sloppiness on an author's part, or it may indicate deliberate striving for effect. A good editor needs to be able to tell the difference. Even on my newspaper, I have occasionally grown frustrated with copy editors whose sole conception of their job seems to be memorizing a list of ruled and applying them indiscriminately. TCK, I had not heard of H.H. Holmes, but I just looked him up. That's a fine surname for a serial killer. Robert, you're fortunate in your choice of a reader. I would imagine that a non-native speaker with a good ear and excellent knowledge of her non-native language might make a fine editor. Such an editor might be especially atune to deviations that slip by a native speaker of the language. I wonder what a 19th-century voice would sound like describing such things. The thought of him justifying and explaining his actions is creepy. "P à D, I can assure you that for every entertaining rant about editors from a Henry James or Raymond Chandler, hundreds of editors have far more gruesome and equally entertaining stories about copy submitted to them." Oh, don't worry... my editors were always delighted to share their traumatised lives with me. There's a funny book by Kevin Myres about life in "The Irish Times" in the 1980's. I'll rummage round for a link as the book is worth reading. TCK, naturally I shudder at the suspicion that the book is anything like a justification. But it sounds as if it might be worth a look. Thanks. Tales, at least in newsrooms -- at least in my newsrooms -- copy editors' horror stories are a kind of secret knowledge. This knowledge is not so much forbidden among non-copy editors as it is disbelieved. There is decidedly a caste system in newsrooms, with copy editors at the bottom -- until it comes time to increase their workload, at which time they will be acknowledged and appreciated, though always as a group and never by name, as individuals. Sweet Lord... are you back in the 18th century? No, it's just that newsrooms tend to be run by former reporters rather than by former copy editors. Ah, I see. A journalist. A very different thing, languagewise, from writing fiction. Not a lesser thing, just a different thing. The British haven't evolved as rapidly as the Americans to writing "short" (short books, short chapters short paragraphs, short sentences, short words, short dialogue). Would you believe that American copy editors object to the use of the progressive, while British editors write it back in? Same with the past perfect. That is the sort of thing that bothers me, plus the assumption that I cannot be trusted to use the English language correctly, because writers generally don't. There, I'm getting "het up" again. I.J., I straddle the boundary between two worlds. I'm a newspaper copy editor by profession, but this blog and the opportunities that spring from it put me in contact with the publishing world. I have also proofread a few crime novels as a free lance -- for European publishers and authors, as it happens, so differences of usage have come up. It's my practice when I find some quirk to alert the author or publisher of it, explain my concern, then let him or her decide whether to make the change. Good computer editing programs make this easier than ever before. I do believe that American copy editors object to the progressive; I tend to think it slows sentences down. (I am a huge fan of the past perfect, though.) Regardless of my taste, though, when editing a book I would certainly share my concerns with the client and explain my reasons before making grammatical changes. Periphrastic constructions such as the progressive might be less suitable for a fast-paced thriller than for a leisurely, atmospheric, character-driven mystery, for example. "A non-native speaker with a good ear and excellent knowledge of her non-native language might make a fine editor." Yes. Frequently, I've wanted to get my blue pencil on an awkward Italian-to-English translation, the latest being Anne Milano Appel's translation of Giulio Leoni's The Mosaic Crimes, 2004/06. However, Ms. Appel has a fine resumé a mile long (including some interesting essays on translating) and she is a fellow librarian (we have to stick together) so I am inclined to think that perhaps Leoni is an awkward writer...? If readers want to see what I mean about The Mosaic Crimes, check out this post at the blog "Comfy Chair Reviews." But it is too bad the truly great translators like Stephen Sartarelli and Bernard Scudder (probably no coincidence that both are/were poets) can't be cloned. Steve: Shame on Putnam. That sort of sloppiness is indefensible. Elisabeth: I once noted some exceedingly awkward passages, including a misused word, in a translation of one of Alicia Gimenez-Bartlett's novels. I conceded that I had no way of knowing whether the author was to blame. I received a reply from someone who said he or she knew the translator's work and suggested that the author was to blame for the awkwardness. This raised the interesting question of what a translator is to do with an awkward passage. Would he or she be out of line in eliminating awkwardness from the translated passage? "Would he or she be out of line in eliminating awkwardness from the translated passage?" I imagine readers would have a variety of opinions on this query but I would have to say "yes," the translator would "be out of line in eliminating awkwardness from the translated passage." I think this has come up before at DBB. A translator might be chomping at the bit to make changes but then he/she isn't being true to the source. An analogy might be with the kind of copy editing decisions that come across our desks every day here at work. Our style requires that we do not "second guess" or try to make a silk purse out of a sow's ear (i.e. a ran-it-through-Google-translate Chinese-to-English abstract) but only make the abstract grammatically, syntactically correct and to add only pertinent info (ex., is the subject stone or wood?) and not to put our personal stamp on the original. Upon reflection, my question is not as clever as it seems. The translator, even more than the editor, needs to be in tune with the effect the author intends and let this be his or her guide in deciding what to do with awkward passages. "...needs to be in tune with the effect the author intends and let this be his or her guide in deciding what to do with awkward passages." Absolutely, but it's a fine line between being in tune and being smugly assured that "Oh, I know what the author means." I freely admit I am not as good as our primary copy editor at reining myself in, at "being in tune." What I'm good at is going over what our primary copy editor has done and "fine tuning" it. To each his/her task! And while we're on the topic of copy editing... I saw an amusing misspelling on the gas pump this weekend. The slot for credit/debit cards was not working and the station had printed up a little sign which included the oft-seen "plese" but what I really kinda liked was their apology for any "iconveneince" this may have caused me. I think, tinkering with it a tad, "iconvenience" might be a possible new word. Iconvenience = A drive-in church for Greek Orthodox believers. I brought up the necessity for being in with the author's aims during an exchange about editing with I.J. Parker. I mentioned then that certain grammatical forms might be better suited to a fast-paced thriller than to a leisurely mystery full of description. A translator ought to be similarly aware of the mood the author tries to create. Then there's Ken Bruen, who has complained about editors. I don't know the substance of his complaints, but anyone editing or translating him would have to be aware of his unusual paragraph breaks, for instance. Iconvenience displays your favorites in easy-to-use graphic form right on your screen! The German word for 'inconvenience', Unannehmlichkeit, is almost a self-fulfilling prophecy : it doesn't exactly 'trip off the tongue', does it? Unless that megalomaniac Steve Jobs has patented iConvenience © 2011 Peter Rozovsky already. The French dérangement comes easily to English tongues, especially in English pronunciation. Although, bringing things right up to date, the current head of the IMF might describe his current predicament as being rather more than yer common or garden 'dérangement'. The top result on my search for "ebamugavus" offered to render the word in -- simplified Chinese. 不适, in case you were wondering. How very convenient for you! Ça ne fait rien or, in its utterly charming English derivative, san ferry ann. If he's sentenced, serves prison time, then gets out, will he be an ex-Kahn? In Boston, perhaps; not sure how they'd pronounce it in Manhattan! You wags! I knew "iconvenience" had a future! And there must be many cases of the translator being a better writer than the book's author. I.J. expressed disbelief that American copy editors objected to the progressive aspect. I told her that I'm no fan of the progressive, as it often slows sentences down. I had in mind my experience as a newspaper copy editor, and I merely suggested to her that certain grammatical forms might be better to suited to certain stories. But yes, I suspect that these mean a good deal less than the sorts of problems you suggest. I have no doubt that some translators and editors are better writers than the writers they edit and translate. But they bear this knowledge with patience, performing their jobs with grace, knowing the work they do is appreciated. I have relatively decent diploma in translation so do not take this subject lightly. I think that every writer should be allowed to find their own voice and sometimes this can be a bit of a shock. Sartre chose to use an ugly style, probably as a reaction against "les bien pensants". I found the book about Ned Kelly by Peter Carey unreadable, as lack of punctuation makes me feel dizzy... which may have been the effect Mr Carey wished to have on the reader. It is taken as read in my book that an editor should know how to write. How, otherwise, would they be of any use? My favourite story is how, when a reader for Gallimard, Gide refused to give Proust a chance. Fashion in words, as in dress, is also a very strong factor. The Ken Bruen example is perfect. Mind you, the first time I read Bruen, I stumbled a couple of times and shook my head, but I never denied him the right to express himself that way. Then, progressively, the poetic passages began to resonate -- particularly, his "triplets", and it became obvious that he was mining a very rich vein of philosophical insights in the most economic manner. I write the sort of book that occasionally drifts into poetic descriptions with a Japanese theme. What can I say? I like the progressive. But as to translations (a superb topic), I suspect the translators had better be totally in tune with the language they render the book in, because foreign idioms must be shifted into American (or British) idiom. (Of course, this operates also for foreign translators of books in the English language). I have read some superb translations that moved very smoothly in English. I've also read translations that contained many idiom-clunkers. I suspect the translators were native speakers of the original language. Sometimes it's possible to tell if the flaw was the author's or the translator's, but since I'm bilingual, it may pop out more for me. In any case, I have enormous admiration for good translators. You insert a text and it coughs up the writer that is closest to that style. Today I seem to be in Dan Brown mode, probably from shock at the latest news about the IMF. P a D: Fashion in words and style are factors, which is one reason the classic get retranslated all the time. Another factor is that one language may not like a grammatical structure that another language uses all the time. Dutch often uses the past perfect where English will use the simple past. And I have read that classical Chinese literature is full of he saids. I read this in a translator's explanation of the decisions he faced when translating a work into English. I.J., Bruen is a good test case for discussions of editing. His idiosyncratic paragraphing and occasionally elliptical style ought to be left alone. I can't say the same for the occasional misspellings and incorrect renderings of names. Tales, that site seems to cough up Stephen King a lot. I got David Foster Wallace. The answer depends entirely on one's conception of what a translator is. The more one believes that the translator is an author in his/her own right, the more the above question becomes absurd. It is simplistic to believe in the sanctity of the source. And foolish to believe that a translation is nothing else but an original creation. Except for school and university exams, I've never translated. But I have to believe that translating literature is a balancing act. One must remain faithful to the spirit of the source but also be a creator in one's own right. Janwillem van de Wetering rendered some of his own novels from Dutch into English and called the results versions rather than translations. Something not yet mentioned (I think) is this: What more could Hammett accomplish if he were not so frequently pickling himself with booze? It is a myth that writers work better when under the influence. And I wish Hammett (and Hellman) would have avoided living the myth. That myth does not enjoy the widespread belief it once did, I think. I don't know as much as I ought to about Hammett's life, but I think some might say that he devoted himself excessively to Hellman as well as to alcohol. 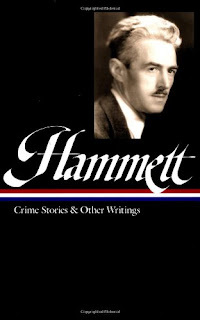 It is my view that neither booze nor Hellman were good for Hammett. 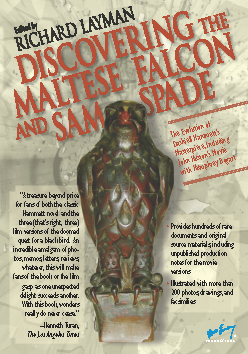 I shall run that assessment b a friend who knows a good deal more about Hammett's life than I do. I suspect she will agree with you. If she does not, I will let you know. 1) TB was no good for Hammett, either. 2) Hellman's main transgressions may have been against Hammett's legacy rather than against his career.